Alpha Cleaning Supplies is your top choice for cleaning suppliers in Perth. With over a decade of industry experience, we are a local business with the experience and expertise to provide for all your cleaning needs. Founded in 2004 by a husband and wife team. Alpha Cleaning Supplies has provided exceptional service from the beginning. Initially focused on cleaning services, we have a team of trained, experienced, and qualified cleaners to perform a range of tasks. We have skilled technicians that are able to service and repair your equipment, keeping your business running smoothly. From cleaning services, Alpha has grown to be a leading provider of cleaning supplies, carrying a variety of environmentally friendly, high-quality products for the Perth market. We have used our industry experience to develop a superior cleaning product, and developed the Palace range of chemicals. This is a range of superior quality product, hypoallergenic and carcinogen free, mixed in-house, that doesn’t compromise on efficacy. 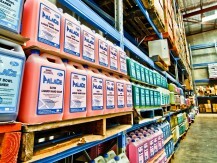 Alpha Cleaning Supplies prides itself on keeping a high-level stock in order to provide you with the products you need when you need them. As a local business ourselves, we understand that time is important. By maintaining a high level of stock, we are able to keep our loyal customers happy with reliable next day delivery in the Perth area. We also have a range of spare parts and machinery hire. We can provide maintenance and repair services for cleaning equipment so your business isn’t set back any longer than necessary. Alpha Cleaning Supplies is a family company that understands the need for quality in today’s marketplace. We offer a high-quality range of products and provide exceptional service to match. Alpha is one of the top cleaning suppliers in Perth. Be sure to contact us today for all your cleaning needs.